Distribution and habitat: Eleocharis acicularis is widespread across Europe, central and southeastern Asia, North America and northeastern South America as far south as Ecuador. Actually, this species is found all the way around the north pole and is common in areas from low to moderate elevations. It is also found in Australia, where it is probably an introduced species. Eleocharis acicularis grows in wet meadows and along muddy edges of pools and streams. It often forms thick mats. This plant prefers areas where the water is present throughout the season. Lemna and Scirpus species are often found with Eleocharis. Description: Eleocharis acicularis is an annual or perennial spike-sedge with long, grass-like stems to about 12-15cm (5-6 inch) in height, shorter in bog conditions, raising from a creeping rhizome. It has very thin stems hair-like and a single terminal inflorescence. Dense colonies of plants with a mat-like appearance are often produced from the rhizomes. In shallow water it will form short spikes of tiny flowers amongst flat overlapping bracts. The tiny flowers are less than five millimeters in diameter and are borne at the tip of each stem in single, sharply pointed, lanceoloid spikelets up to about six millimeters long. The florets are cross-pollinated by wind. The resulting achenes are small enough to be blown about by the wind or they can be carried by currents of water. In wild, the culms of these colonial plants are initially erect, but they may later lean in different directions. Leaves are not retained year to year. Submerged, usually nonflowering plants are abundant throughout much of the range of the species. They have been called Eleocharis acicularis forma fluitans, Eleocharis acicularis forma inundata, Eleocharis acicularis forma longicaulis, Eleocharis acicularis forma submersa or Eleocharis acicularis var. submersa. The culms of the submerged plants are terete, smooth, soft to flaccid. Although Eleocharis acicularis is very variable, recognition of varieties is premature pending a worldwide taxonomic revision of Subgenus Scirpidium. Much of the variation is apparently due to phenotypic plasticity in response to environmental factors, especially water depth. The Eleocharis acicularis has a moderate life span relative to most other plant species and a moderate growth rate. Eleocharis acicularis is a plant of marshes, vernal pools and bogs. It is sold commercially as a aqua-scape plant suitable for artificial aquatic environments such as aquariums, paludarium and ponds. Aquarium care: Eleocharis acicularis is amphibious and will thrive either partially or fully submersed. It grows moderately fast and will quickly spread from throwing out runners, covering the bottom of the aquarium with a tick carpet of grass. 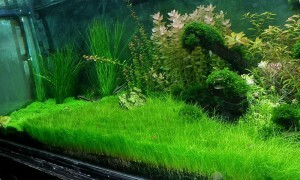 Eleocharis acicularis is a great plant for beginners in aquarium scape. Usually, Eleocharis acicularis is placed in the foreground or midground areas of the aquarium. The grass-like appearance can either balance well with against rocks or other carpet foreground plants such as Hemianthus callitrichoides, Glossostigma elatinoides, or Sagittaria subulata. Eleocharis acicularis can also be used as ascents to an aquascape, by strategically placing small patches of the plant among rock crevasses or other plants such as Riccia fluitians. It will make an excellent spawning medium. Eleocharis acicularis may require cutting or pulling of brownish, dying material or replanting of healthy bunches. However, it seldom gets out of hand and is very easy to control by cutting the wandering stems in the spring before the next growing season begins. Use a pair of good quality aquarium scissors to trim the Eleocharis acicularis to the desired length. Use a soft fish net to remove the clippings from the tank. Make sure to give adequate water flow and clean it by light vacuuming any unnecessary debris that collects onto the grassy leaves. These plants tend to get algae infested or dirty quickly if conditions are not appropriate. With Eleocharis acicularis is not a big problem keeping it contained once it is established. Just pull out the plants as they spread to undesired areas. Water: Eleocharis acicularis require acidic to slightly alkaline water (pH 6.0-7.2) and mild hardness (KH to 10). It thrive submerged in depths up to 30cm (12 inch) deep and good water flow will keep it looking nice and clean. This sedge grows even in brackish. Substrate: Eleocharis acicularis will thrive in a fine-grained, nutrient-rich substrate and quickly form a dense carpet over the entire aquarium substrate. The rhizome and roots will penetrate approximately 1.2cm (0.5 inch) deep and stretch through fine grain substrates. Gravel or sand is a good substrate for Eleocharis acicularis. Substrate granulation is an issue: with small grains the roots might not be able to get a good hold and the sand tends to compact, while larger gravel has a tendency to collect pockets of rotting detritus. Ideal size is 2-3mm gravel or 1-2mm corarse sand layered in about 7cm (3 inch) on the bottom of the tank. The bottom one third of the gravel can be supplemented with a fertilizer, of which popular choices are peat (softens water), laterite (a clay containing iron, usually used with undergravel heating systems), and soil. These supplements are not effective when used in tanks with under-gravel filter system as the nutrients will be sucked directly into the filter instead of keeping it within the bottom of the gravel. Light: Eleocharis acicularis require medium to high level of light. Provided plenty of light 10-14 hours per day, about 0.5 watt per litre (2 watts per gallon) or more, in the color temperature of 5000 to 7000 Kelvin (day white to cool white light). The brighter light is, the lower this sedge will stay. Temperature: Eleocharis acicularis makes an easy addition to cool to tropical tanks. It can be housed in water from 10 to 30°C (50-86°F). Feeding: Give to Eleocharis acicularis high quality liquid and substrate fertilizer. Root tabs should be added to the substrate under the plants and liquid or powdered fertilizers should be added to the water. It will also benefit from CO2 supplementation. If the plants have a deficiency of even one of these factors, their growth will be limited. 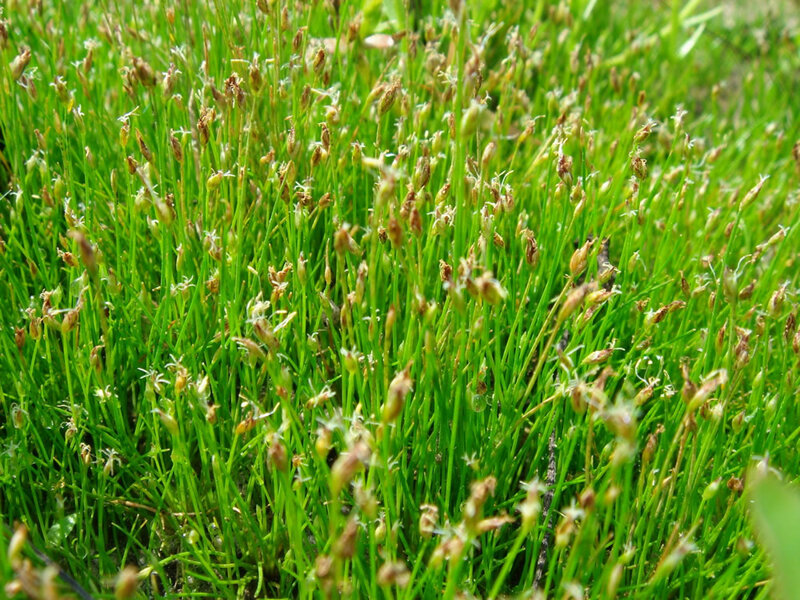 Companion plants: Once dense or overgrown Eleocharis acicularis can be trimmd down to 2-3cm (0.8-1.2 inch) to encourage new growth. It also looks effective when planted between rocks or against other foreground plants such as Hemianthus callitrichoides, Glossostigma elatinoides, Sagittaria subulata or Riccia fluitians. Pond care: Eleocharis acicularis is ideal for natural ponds to help prevent soil erosion at the edges or as plant in baskets for ease of maintenance. It is either aquatic or marginal plant in shallow water or damp soil. These plants offer a good habitat for pond life – it will provide welcome cover for amphibians, fry and other aquatic life; in deeper areas it is a good spawning medium for fish. This is a very low maintenance aquatic plant which spreads to form large clumps quickly. All wandered stems may be cut to control plant growth. Usually, these sedges are grown as oxygenating plants from the bottom of ponds or water features. Their submerged leaves give off bubbles of oxygen, improving the water quality for fish and other pond life and maintaining the ecology balance of the the pond. These plants also absorb mineral salts from the water and reduce algae growth. Pond water: Eleocharis Acicularis is an aquatic submerged perennial plant which is adaptable to shallow or deep water. If planted above water level, the plant will produce tiny flowers atop each stem in summer. Eleocharis acicularis is a great plant for small water features. Also grown as a fully submerged aquatic plant in outdoor and indoor ponds with up to 45cm (18 inch) of water above the planting basket. It can be housed in non alkaline water with medium-hard hardiness – 4-12°GH. Good water flow is preferred to stagnant water. This sedge has low tolerance to drought and has medium salinity tolerance. Pond substrat: Eleocharis acicularis plants should be placed in pond plant baskets filled with aquatic soil – ideally, soil containing silt, sand or mud – and topped with a thin layer of gravel to help prevent the soil from washing away. Plant Eleocharis acicularis in spring in a medium sized pot, keeping plant spacing at about 20-40cm (8-16 inch). 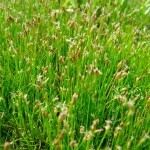 Clay, loamy or sandy soils with pH from acidic to alkaline or neutral can also be used to plant Eleocharis acicularis. Pond position: Eleocharis acicularis thrive in full to partial sun. It does not tolerate the shade. Most growth and development occurs during the warmer summer months. Eleocharis acicularis is frost resistant. Propagation: Eleocharis acicularis propagates with runners that branch off from the root area forming thick culms. Cuttings from a mature culms can be replanted in the substrate to form new plants. For best results under optimal conditions, plant Eleocharis acicularis in small 1cm (0.4 inch) groups in the substrate at roughly 2.5cm (1 inch) intervals. In aquariums these plants look their best when planted directly into the substrate. In ponds, they can be planted in medium sized pots for easy maintenance. Fully submerged Eleocharis acicularis plants will not produce flower, so culms dividion remain the only way to propagate these plants. Additional, at commercial scale Eleocharis acicularis is propagated by bare root, seed or springs. Problems: Eleocharis acicularis are diseases free and easy to grow if the requirements for light and fertiliser are met. Eleocharis acicularis turn brownish in absents of CO2. Treatment: Give these plants CO2 injection for healthy growth. Overabundance of fertilisers may cause problems, such as plant malnourishment, undue algae growth or toxic buildup. In wild, there are several species of leaf beetles and leafhoppers known to feed on Eleocharis spp. Other insect feeders include few caterpillars. Some of these insect species are associated with wet prairies and they are quite rare. The seedheads of spikerushes are eaten by such wetland birds as rails, coots, ducks and geese. Note: Submerged Eleocharis acicularis plants may closely resemble aquatic forms of some other species, especially Eleocharis parvula, Eleocharis robbinsii, and Schoenoplectus subterminalis. 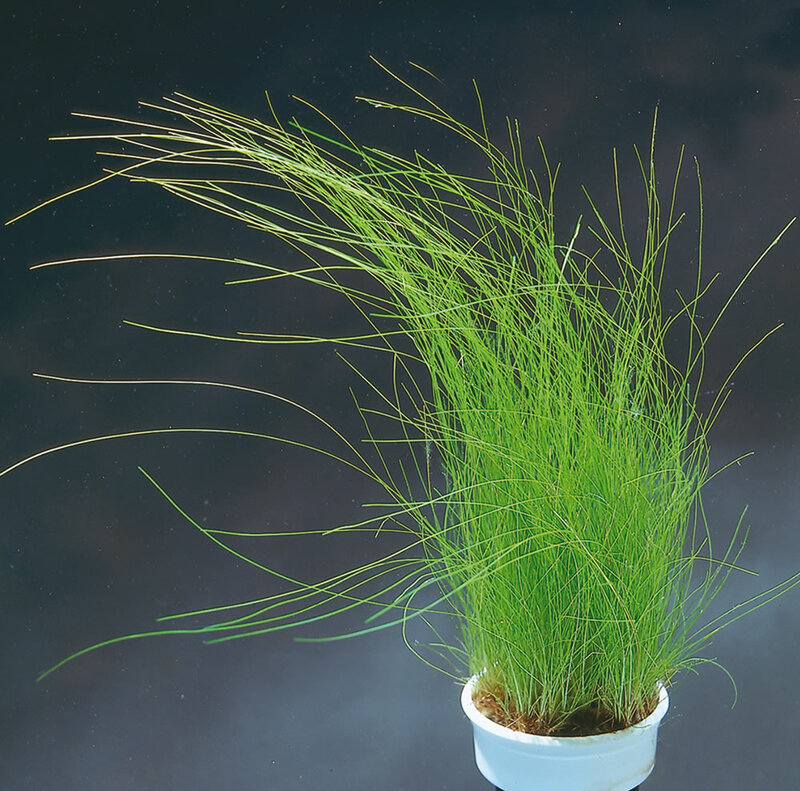 Uses and display: Eleocharis acicularis are suited for aquaterrariums but they can be cultivated in aquariums for wispy, soft and natural feeling. 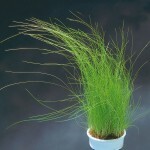 It is an attractive bottom covering plant with long light green grass-like leaves. Eleocharis acicularis is a fantastic plant for an Iwagumi aquascape. 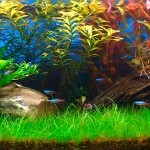 It has much to offer an aquarist looking for a fast, forest-green cover or accent clumping. In nano aquascapers, Eleocharis acicularis has the potential to make a great background plant. This plant can be use for ponds, ground covers, bog gardens, water features, streams, waterfalls, usually as mass plantings. It is suitable for small, medium and large ponds. Also this sedge is grown as a fully submerged aquatic plant in outdoor ponds.